Good afternoon Ladies and Gentlemen. May I start by thanking Allen & Overy for working with Gresham College on this series of lectures in the Docklands. I personally hope that these Commerce lectures are of particular interest to the Docklands business community and am pleased to be giving the second Gresham lecture here today. I’m delighted to see so many of you choose to open your minds in this Docklands common on this Wednesday afternoon. This is a particularly timely lecture when we have just seen the $1.65 billion acquisition of YouTube by Google last week. YouTube is, intriguingly, not just an intellectual property firm, but an intellectual property firm based entirely on other people’s intellectual property, their videos. Before we get going, of course I have to warn you that this lecture is based on my intellectual property and many others, but I’m happy to invoke copyleft, unless afterwards you think that I should protect bits of it! As you know, it wouldn’t be a Commerce lecture without a commercial, so I’m pleased to announce that the next Commerce lecture will continue our theme of better choice will explore the challenges posed by the global role of non-governmental organisations – “Who Hates Globalisation? Are NGOs Outlaws, Inlaws or the De-Militiarised-Zone between Markets and Governments?” on Monday, 20 November at Barnard’s Inn Hall at 18:00. There is an old joke, loosely based on the writings of 19th century anarchist political philosopher Pierre-Joseph Proudhon. Why do anarchists drink herbal tea? Because proper tea is theft. Today’s talk is going to touch on the current confusion in intellectual property between anarchy and theft. I also want to share some of my concerns about how much of a global commercial battleground some of us expect intellectual property to become and, finally, I intend to propose a couple of ideas, though hardly solutions. intellectual property protection - laws that establish and maintain ownership rights to intellectual property. The principal forms of intellectual property protection are patents, trademarks, copyrights and trade secrets, though it is also worth noting that domain names fall into a relatively new category related to trademarks. Now all three forms of protection have rich and interesting histories. Patents are an international phenomenon and arise from the monarch’s interpretation of monopoly. Supposedly the first modern patent laws date to 1474 in Venice. They came with a ten year time period and a 100 ducat fine for infringers. From the beginning, patents have been widespread and recognised as a deal between the state and the holder of the “letters patent”, i.e. an open letter issued by a monarch or government granting an office, right, monopoly, title, or status, to some one or some entity, but typically in return for a service or funds. In England, it was common practice for Tudor monarchs to grant monopolies for trades and manufacture in order to raise revenue. From 1561 to 1590, Elizabeth I granted about 50 patents whereby the recipients obtained monopolies in the manufacture and sale of commodities such as soap, saltpetre, alum, leather, salt, glass, knives, sailcloth, sulphur, starch, iron and paper. Monopolies for commodities were so abused that in 1610, James I, forced by public unrest, declared “monopolies are things contrary to our laws”, but this couldn’t last. The House of Commons formally declared monopolies illegal in 1624, but Charles I got round this by selling monopolies renamed as “patents” of fourteen years to inventors. The United States Patent Office was established in 1790, while the UK patent office came later in 1852, following concerns over protecting British intellectual property raised during the Great Exhibition of 1851. It was only during the 1905-1907 period that the UK Patent Office rationalised its numbering systems, thus assigning formally Patent Number 1 to a 1617 patent granted to Rathburn & Burges for “Engraving and Printing Maps, Plans &c”. In the USA, the very first patent was issued on 31 July 1790 to Samuel Hopkins, whose identity has been questioned, for a process for making potash and pearl ash. The patent was signed by President George Washington and Secretary of State Thomas Jefferson. As in the UK, patents were issued by name and date rather than number. The US Patent Office had already issued nearly 10,000 patents when a fire destroyed many of the original records in December 1836. The 2,845 restored patents were issued a number beginning with an “X” so the first US patent ever issued is patent X1. Bass Ale was founded in 1777. A century later, the Trademarks Registration Act of 1875 took effect on 1 January 1876. On New Year’s Eve a Bass employee waited outside the new Trademark registrar’s office overnight to register the first two trademarks. Can you imagine it? New Year’s Eve and you’re holding a red equilateral triangle and a red diamond. By the way, the triangle was apparently registered first. Ancient Greeks and Romans were concerned about being recognised as the authors of their works, but as everything was manuscript, copied by hand, the costs of distribution kept things under control. As always with intellectual rights, technology changed things. Most English disputes were resolved via common law, but the invention of printing in the late fifteenth century created a demand for copyright protection. In 1710 the Statute of Anne passed into law providing protection via an act of Parliament for copyright in books and other writings. Today, copyright protects literature, including novels, instruction manuals, computer programs, song lyrics, newspaper articles, website content and some types of database; drama; music; art, including paintings, engravings, photographs, sculptures, collages, architecture, technical drawings, diagrams, maps and logos; layouts used to publish a work; or recordings of a work, including sound and film, and broadcasts of a work. Finally, trade secrets tend to be ignored, but they are critical. What greater protection can one have than total secrecy? As Aristotle Onassis, a man who knew a thing or two about money, noted, “The secret of business is to know something no one else knows.” Secrecy has guarded the Coca-Cola formula for well over a century. Many types of intellectual property, take a mining claim for example, rely on secrecy. I believe that my assessment of the mine is better than that of other potential stakeholders or, in many cases, the government. What is a standard such as a new data format other than a trade secret I decide to share for my own benefit, licensing for mutual use and indirectly sharing rewards if it is adopted? Does our attachment to intellectual property grow in proportion to our uncertainty of the future? We have big changes in the where, when, who and what of intellectual property. Where – We are trying to export a model of intellectual property that didn’t actually build our economies at their early stages. The US believes that over 50% of its exports depend on intellectual property. The United States and the United Kingdom are the only two nations who consistently receive net balance of payment benefits from intellectual property, so not surprisingly they are among the chief supporters of intellectual property systems. The Trade-Related aspects of Intellectual Property rightS” (TRIPS) Agreement of 1994, negotiated under the World Trade Organization, is trying to harmonise IP laws. The EU has set up a European Patent Office that processed over 160,000 patent applications in 2003, double the 1995 figure. The EU has introduced Community Patents and Community Trademarks. 500,000 Community Trade Marks have been filed. We have increasing patent, trademark and copyright disputes abroad with miscreants among the developing and the developed world. When – extensions to the term of copyright protection in both the USA and Europe are now so common that it is doubtful that copyright on many, many works will ever expire. In 1998, the US enacted the Copyright Term Extension Act of 1998, sometimes ridiculed as the Mickey Mouse Protection Act for obvious reasons. Under the previous Copyright Act of 1976, copyright lasted for the life of the author plus 50 years, or 75 years for a work of corporate authorship. The Copyright Term Extension Act extended terms to life of the author plus 70 years, or 95 years for a corporate work. Now no additional works from 1923 or later, that were still copyrighted in 1998, will enter the public domain until 2019, unless the owner chooses. “Happy Birthday” was written by two sister schoolteachers in 1893, but the lyrics as we know it were copyrighted in 1935 by the Summy Company as an arrangement by Preston Ware Orem, so the lyrics aren’t scheduled to expire till 2030. But if the pace of change is increasing, copyright term should be falling not rising. Who – all types of extensions exist for new technologies, e.g. databases, as well as new types of “author”, such as corporations. It is more common to see that the concept of work-for-pay has led to the idea of an organisation being the legal author of works created by employees; the EU in February 2006 enacted the law of droite de suite, a work by a living artist attracts a tax equal to 4% of the sale price each time it changes hands, though sales less than €1,000 are exempt and there is a cap of 12,500. What – My five year old daughter asked for a CD for show and tell. I pulled out the equivalent LP I happened to have. “Wow Daddy, there must be a lot of music on that” she exclaimed. Things are changing. The grant of patents in some jurisdictions over certain life forms, software algorithms, databases, chemicals and business models has led to ongoing controversy over the appropriate scope of patentable subject matter. We have issues such as bioserfdom or unfair appropriation of indigenous knowledge. We have Apple fighting Apple over rights – computers versus music. National Geographic is dragged through the courts (Greenberg versus National Geographic, 2001) because of its attempt to use market power to appropriate additional rights for collective use of photographs in digital media with no compensation. Am I stealing when I hack virtual money, or just showing that it is poor intellectual property? Who owns an online gaming avatar, the game owner, the player, both of them, other players? Why does a cartoon dog advertising insurance qualify to trademark the name ‘Churchill’? US Patents soar. The success rate of applications is fairly stable, about 50% over the century, but the number of overseas applicants is up from 10% to 50%. The EU too has seen similar growth in absolute and foreign applications as patents go global in a limited number of dominant jurisdictions. My discussions on intellectual property with most of my legal friends descend into a morass of the obvious along with some fun nuggets in the muck, yet debates on intellectual rights and morals go back a long way. I had the privilege of viewing an old set of Martin Luther’s letters this summer at Harvard’s rare book library, the Houghton Library. Martin Luther states strongly in a 1528 letter to Hertzog Georg zu Sachsen, „Dieb ist Dieb, er sey Geld-Dieb, oder Brief-Dieb” – a thief is a thief, be he a money thief or a letter thief. Jefferson is pointing out that once you reveal an idea it is gone and you can never get it back; in economic terms an idea is imperfectly excludable. Jefferson believes in the moral improvement of mankind through the sharing of ideas. Jefferson, like Gresham and others, believed in New Learning, Natural Philosophy and Enlightenment through the sharing of ideas, not profiting from them. Jefferson implicitly believes that without governments, somewhat obviously, we couldn’t have patents, trademarks or copyright. ‘Intellectual property’ as a description has been criticized by some on the grounds that the rights conferred by exclusivity are more limited than legal rights such as physical property. Stephan Kinsella objects to intellectual property on the grounds that the word ‘property’ implies scarcity, which may not be applicable to ideas. Critics feel that using the word ‘property’ favours expansion of rights in intellectual products. These exclusive rights are a government grant, not a fundamental right held by citizens. For example, most nations grant copyrights for only limited terms, despite what Sir Cliff Richard would like; all countries limit the terms of patents. “The granting of patents is often described as a ‘social contract’: society grants the inventor a temporary monopoly in return for which the inventor discloses his secrets. Without patents, the argument goes, technological information would be kept secret or disseminated much later. This line of reasoning represents patenting as an ‘altruistic alternative’ for trade secret protection. However, the proponents of this argument seem to be overlooking a few things. As we know from behavioural economics, economics needs to be based on empirical evidence, not a mythical homo economicus. The homo economicus of intellectual rights supposedly gains no reward from the pleasure of invention nor from the social cachet of advancing society, he or she just wants cash. Ilana Mercer and Stephan Kinsella argue that patents and copyrights “are a burden to marketplace transactions and discourage business startups” while James DeLong believes “ownership of ideas and a market system are the only reliable incentives for productivity.” The arguments for and against intellectual rights move back and forth, but almost solely on moral or legal grounds, sometimes on economic theory, rarely on economic fact. The Economist, in a survey last year, bemoaned the dearth of empirical evidence supporting intellectual rights. There is a lovely article called “Coase’s Penguin” by Professor Yochai Benkler from Yale Law School. He explores how intellectual property law might be reconsieered in light of commons-based peer production. He links Ronald Coase’s work in the 1930’s on transaction costs and firm size with Linux’s mascot, Tux the penguin. Benkler advances this model delineating where commons work best based on recent experience in open software rather than closed. You can see how intellectual property markets fall into the bottom right category in most instances, a common property regime. We have seen a rise in alternative ways of dealing with intellectual rights. One big question, particularly with the success of collaborative efforts such as Linux or Wikipedia is whether global advancement needs ‘closed source’, or should go increasingly ‘open source’. Stallman is worth a lecture on his own, but suffice it to note that he has been a great proponent of alternative means of dealing with rights, most of his means try to ensure that rights meant to stay free, stay free, or try to create rights that allow people to work together cooperatively. He worked with colleagues to create the concept of Copyleft, the GNU programming project, and the Free Software Movement. Copyleft recognises that statements for waiving copyright are legally required because the Berne Convention in international copyright law protects works even if no copyright statement is attached to them. “Anti-copyright” statements typically do not take the form of either sophisticated open content licenses or a simple dedication to the public domain; instead, they may just encourage wide distribution. Stallman has developed, shared and promoted a disclaimer that makes it possible to denounce all claims to copyright in a work including moral rights. However, there are other approaches. For example, Creative Commons is an NGO founded in 2001 that provides a number of copyright licenses designed to help copyright holders to grant some of their rights to the public while retaining others. The intention is to create durable copyright conventions that help share information. There are numerous “rights commons” where researchers in various disciplines agree to share information ranging from preprints, such as Arxiv.org, to journals, to gene sequences, to chemical formulae. Society is also changing its view about the ownership of intellectual property. To see this at the grassroots, I have friends working in higher education who lament the difficulties of preventing plagiarism, not just in homework or papers done using the internet, but such things as WiFi cheating in examinations under invigilation. The examination problem bears some similarity to intellectual property problems. Because of technology, the barriers to cheating are lowered. Global technological savvy and global technological availablility mean that content available for cheating is enormous. The emphasis on getting ahead makes the rewards of successful cheating higher. Thus, students don’t feel a moral pressure not to cheat, just the bureaucratic pressure of “don’t get caught”. In some universities the entire pedagogic process is under review from the honour systems to instant messaging to exams proctoring with sophisticated radio detection devices. Education is adjusting to changing societal norms, not students to traditional educational norms. “… truth remains the cornerstone of sound research and education. Truthfulness presupposes accuracy and honesty [how much of this lecture is owed to others, yet few are noted, others are forgotten, others slip through due to carelessness] … These are virtues whose exercise confers no personal advantage. The only thing that one possibly keeps is a pure conscience and a feeling of integrity. Ultimately, truthfulness becomes a value that is sought for its own value. It produces nothing.” [Pattyn, 2006, page 214] As ever, this puts truth in conflict with greed. There are many examples of the perversity of intellectual rights. The technologies involved include computer software, cable television, jukeboxes, Ipods, mobile telephones, cement recipes, fizzy drinks, music recordings, drugs, chemicals, algorithms, mathematical formulas, shapes of furniture. The internet is the world’s greatest copying machine. There are also numerous examples, too many if we want to get to the point this afternoon, of the paradoxical nature of intellectual rights. These examples include cases where copyright actually harms the commercial interests of copyright holders, or where copyright impedes interesting derivative works, or the Digital Millennium Copyright Act resulting in people exercising free speech being locked up or Digital Rights Management (DRM) controlling usage to the point it limits fair use provisions of copyright law. My favourite example of technology disrupting stable intellectual rights concerns music. You might think my example will focus on Napster, Kazaa , Grokster or Gnutella, but you’re wrong. I want to talk about an incident in the 1800’s. Piano rolls [Lessig, 2002, pages 108-109]. Originally, copyright only extended to sheet music as a publication. An early example of piano rolls in action was the Pianista, developed by Henri Fourneaux in 1863, though ultimately the best known was the Pianola, created by Edwin Scott Votey of Michigan in 1895. By 1902 “about seventy-five thousand player pianos in the United States, and over one million piano rolls were sold.” The composers complained about the pianists stealing their sheet music, the pianists complained about the manufacturers stealing their interpretations. After the Supreme Court pointed out some gaps, Congress changed the law by creating the idea of a “compulsory licening right”. Today the Recording Industry Association of America remains on the front lines of the fight against what it terms “piracy”. The industry has had victories against some services, including a highly publicized case against the file-sharing company Napster, and some people have been prosecuted for sharing files in violation of copyright. One consequence of Betamax technology’s introduction to the U.S. was the 1984 lawsuit Sony Corporation versus Universal City Studios (the “Betamax case”). There the US Supreme Court ruled home videotaping legal because home videotape cassette recorders had substantial non-infringing uses. This precedent was later invoked in the 2005 MGM versus Grokster case where the high court confirmed the same “substantial non-infringing uses” standard for authors and vendors of peer-to-peer file sharing software. Though the high court made a point of excepting those who “actively induce” copyright infringement through “purposeful, culpable expression and conduct”. There have also been some folks who’ve had fun with these laws. 100 years ago Mark Twain had a quick bit of fun saying he intended to extend copyright on all his works by reissuing the full texts in his autobiography. One of the classic ripostes is that you can’t patent a mathematical formula or equation, though a number have tried trademarking mathematical or scientific symbols. The Register (an internet IT rag) ran a fun spoof in November 2003 about a fictional company, Softwron, patenting an integer in the “so-called high 64-bit range, from 4,294,967,296 to 18,446,744,073,709,551,615”. But truth is stranger than fiction as in 1995 Roger Schlafly obtained US patent 5373560 for a “Partial Modular Reduction Method”, an algorithm for finding prime numbers that have this particular property. Schlafly, a member of the League for Programming Freedom that opposes software patents, was quoted, “I was kind of interested in pushing the system to see how far you could go with allowable claims …When you get to numbers that are so big that nobody has used them before, well, there are lots of them up there”. 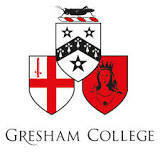 Gresham College isn’t immune to IP spats either. Sir Roger Penrose, former Gresham Professor of Geometry, took legal action against Kimberly-Clark for their use of Penrose tessellations on their toilet paper. We’ve had the recent incident of Danger Mouse and “The Grey Album”. In 2004 Brian Joseph Burton, better known as Danger Mouse, is an American producer and DJ who remixed, in what’s known as a “mash-up”, The Beatles’ White Album and rapper Jay-Z’s Black Album to make The Grey Album. EMI, the White Album’s copyright holder, ordered Danger Mouse and retailers carrying the album to cease distribution of the album, which only created enough notoriety to make it a highly popular web download. To illustrate some other problems, look closely at this eight year old’s drawing. Despite having significant paternal feelings, I wonder if she should be locked up. Can you see the obvious Mona Lisa rip-off, not to mention some of the other pictures in her gallery? Or should I be more worried about her younger six year old sister? This is clearly a rip-off of a rip-off. Hopefully, you’ll agree with me that my children deserve praise, not jail. All intellectual rights stem from other people’s work. John Kay again, from yesterday’s FT, “If men of genius such as Newton stand on the shoulders of giants, how much more limited are the claims to originality of the promoters of pop artists, the publishers of pulp fiction and the designers of car doors and toner cartridges.” Are we in danger of locking up our culture to the point we can’t use it to advance our culture? How can I make fun of Mickey Mouse without being sued? Let’s think Jerry Maguire’s catchphrase – “Show me the money!” A survey of intellectual property in The Economist noted that IBM earns over $1 billion from its IP; Microsoft is on course to file 3,000 patents per year, when in 1990 it received five; companies such as Qualcomm or ARM make almost all their money off designs protected by patents. Of course it is in the interests of large firms to exaggerate their IP intensity to shareholders and their IP strength to competitors. Patent filings are relatively exact by number, but monies derived from IP inflate. Marvel, the comics firm, makes $230 million per annum from licensing transactions. The US Major League Baseball Players Association sues fantasy baseball leagues for using baseball data. Generic drugs is a $60 billion industry, 13% of the global industry. Hollywood claims it loses $250 billion per year (that’s well over 10% of UK GDP) in lost sales from piracy and counterfeiting. The software industry claims $35 billion. The combined luxury, software and media goods industries claim $600 billion a year is lost. The UK Anti-Counterfeiting Group estimates that clothing and footwear industries lose 3.2% of annual revenues to fakes, though Davenport Lyons points out that this is both based on the brave assumption that people who have bought a fake would have bought the original and note that most of these purchases are made in the UK and Europe, not in the ‘criminal’ countries that manufacture the counterfeits. Criminals can make more money out of a kilo of CDs than a kilo of cannabis. Japan’s NEC uncovered an entire system in China that made Colombian drug cartels look amateur. The system was hollowing out NEC from the inside, including charging royalties for their licensed products, that is royalties for the products of the counterfeiters! The Bayh-Dole Act of 1980 was supposed to encourage US academics to file applications, seek licensees and reward inventors. It is, somewhat unthinkingly, seen as desirable by overseas universities, but is coming under increasing attack in the USA. Once universities seek to make money, they find themselves tangled in the spaghetti of conflict that affects commercial researchers. They are unable to share research as effectively as in the open commons of an academic environment. In fact, in 2004 America’s National Institutes of Health, which spend $30 billion on research per annum, recommended that “whenever possible, non-exclusive licensing should be pursued”. Everything is fine till we talk about money. John Kenneth Galbraith pointed out that the greatest problem with economics is “its wilful denial of the presence of power and political interests”. We have to recognise that patents, trademarks and copyright are not about abstract science or symbols or text. Ideas and their exploitation are part of society. Ideas are created and developed by people in social organisations. Therefore our frame of analysis must be social organisations and bound up with money. One might argue that more invention occurs after patents come into existence, but this is typically measured in patents. One might more strongly argue that patent numbers grow to protect the power and influence of growing industrial interests. It is interesting that we measure innovation by patents, yet patents are not a measure of success, they’re a measure of people’s belief that they can derive money from patents. We find that the creative periods in many industries, chemicals in the early part of the 20th century, computing in the 1960s or biotechnology in the 1980s precede, not follow, the appropriation of intellectual property. Once things start to become valuable, we start to fight over the money. The cyber-punk author William Gibson was asked how he came up with his futuristic ideas. He said, “the future is already here; it’s just not evenly distributed.” Part of the problem with inventions and works of art is that only a very few are very valuable. Uneven distribution leads to monies from intellectual rights being more like a lottery. After we have a few lottery wins in new technical area, everyone rushes in to buy lottery tickets, process patents in the 1990’s, biotech in the 2000’s. Too much of the time we find people chasing lottery monies that have gone; crying over spilt milk, “I should have patented my early works”. The lesson they learn is not to do more, but to defend aggressively every scrap of advancement. A decade later, in 1963, Harvey Ball created a yellow button with a smile, two dots representing eyes and a half circle representing a mouth for the Massachusetts insurance firm State Mutual Life Assurance which was trying to cheer up employees during a rocky merger. The urban myth is that Harvey missed out on millions from the Smiley. Actually, there was an attempt to trademark the image in the USA, but it fell into the public domain before that was successful. David Stern of a Seattle advertising agency also claims to have invented the smiley, but in 1967 as part of an ad campaign for Washington Mutual. Without embarrassment, Franklin Loufrani of London’s SmileyWorld says he came up with the image, but in 1968, and has trademarked it across 80 countries. These days the smiley is associated more either with web emoticons (SmileyWorld’s main business) or Acid House music and the drug Ecstasy. This tale would be a simple one of good idea, were it not for the fact that each person thought that significant amounts of money might arise. And then we look at the popular Crazy Frog of 2004 ringtone that did! Some consider that the expansion of intellectual property laws upsets the balance between encouraging and facilitating creativity and innovation, and the dissemination of new ideas and creations into the public domain for the common good. Most new ideas are simply derived from other ideas; intellectual property laws tend to reduce the overall level of creative and scientific advancement in society. Innovation and competition are stifled by expanding IP laws, as litigious IP rights holders aggressively or frivolously seek to protect their portfolios, “IP vultures”. To date NASA has filed 6,509 patents, in developing the A6 Audi has filed 9,621. Yes, cars are more complicated, but not that non-obvious. Patent growth is the growth of mutually assured destruction, not an indicator of advancement. It’s a bit like saying that the USA and Russian economies benefited by building larger and larger nuclear arsenals. It may have been necessary, but it was not advancement. In fact, these firms do not feel comfortable even with the arsenals. “… why would a firm with a legal patent strike such a [generic drug] deal? One reason could be that some drugs giants regard settlements as a way to bribe a generics firm to delay its introduction of a cut-price product … cost and legal uncertainty associated with patent trials are simply too great … But there is a less charitable explanation. The big firm may know that its patent was mistakenly awarded, perhaps because the purported breakthrough was too minor or obvious”. [The Economist, “Drug Patents: Under Attack”, 9 September 2006, page 72] One continental researcher confessed to me that their firm buried generic firms who contested patents under container loads of documents during discovery, realising that the court case could outlast the patent. Here in the offices of such a distinguished legal firm, it would be daring of a non-lawyer such as I to even begin to discuss changing the legal aspects of patents, trademarks and copyrights, let alone some of the interesting international divergences in coverage or treatment of intellectual rights. Nor do I wish to do so. In fact I found most of my legal friends focused on the technicalities of the current system. If they had recommendations they were about things such as changing prior art disclosure or grant opposition or, as lawyers are wont, fee-shifting. So what might we propose from a commerce perspective? Well, the first thing is to acknowledge that those who consider the abolition of intellectual rights have a point. Perhaps there exists a moral right to not have someone claim your work as their own, but beyond that all the legal rights appear to be grounded in the need for a utilitarian system for society, based on the premise that intellectual rights help society develop more intellectual capital than it would without them. On pragmatism, Fritz Machlup in 1958, who stated “No economist, on the basis of present knowledge, could possibly state with certainty that the patent system, as it now operates, confers a net benefit or a net loss on society …If we did not have a patent system, it would be irresponsible … to recommend instituting one. But since we have had a patent system for a long time, it would be irresponsible, on the basis of our present knowledge, to recommend abolishing it.” [from Belleflamme, page 284] Thus our suggestion has to accept that we start to try and improve the situation today, not abolish things. Some people, Professor Samuel Oddi for instance, would invoke the idea of a “revolutionary patent” for pioneer inventions – outstanding inventions distinguished from the mundane. Jeff Bezos of Amazon, despite vigorously defending his shareholders interest with patent defences of processes such as 1-Click, proposes that the lifespan of software patents should be shortened from 17 years to between 3 and 5 years. "At Internet speed," he says, "you don't need 17 years." Further, he suggests that there be a short period to give the Internet community a chance to provide prior art before a software patent is issued. Other people believe that establishing intellectual property exchanges will help provide liquidity to the system, and I know of a few budding intellectual property exchange that just might do that. However, I believe that a simple rewiring of the core market creating intellectual rights might make a huge difference. From an economic perspective rather than a legal one, many of the difficulties with intellectual rights stems from avoiding some of the economic conclusions. For instance, trademarks and patents are markets limited by rationing based on trademark and patent office resources. Rather than attracting more resource if things get busy, poorer work is done. There is a fixed price, set at a high base level for the work. There is little redress if a patent or trademark is poorly awarded. There is a fixed cost to enter the commons, but little return to the public based on what people take from the commons. Copyright is a confused market with no barriers to entry. issue at auction a strict number of tradeable options to file patents, copyrights and trademarks each year, for different durations. set a requirement for patent, copyright and trademark offices to indemnify prior art and other safeguards by quoting a price for the indemnity (insurance) and publish the amount of the indemnity and the amount paid by the applicant. This approach would provide dynamic pricing of the value of these monopolies on the traded option market, i.e. how much do people and companies wish to pay to gain a monopoly. If the price is very high, crowding out smaller players, then we may wish to have a societal debate as to how much protection, how much resource, how many instruments we wish to issue. If the price is very low, then we get a better flavour of what matters and can trim resource. We can see clearly if these offices are effective, based on what people are prepared to pay to have access. The option means that the patent, copyright and trademark offices have orderly queues, while the indemnity means that the degree of risk of sloppy work is clear and they still have to keep up standards of acceptability. If the indemnity is reinsured, then we have even better market indicators of risk. If we accept the concept of competing offices sharing a registration database (somewhat similar to the international patent office situation today), then, for example, Patent Office A can be contrasted with Patent Office B on economy and efficiency measures as well. I could expand on Controlled Options Markets for Intellectual Rights further, and it is rather bold, but I’m afraid that without some material change such as this we are condemned to muddle through. But the muddle is growing to the point one can foresee global commerce locking up because no one can afford the fees to unpick myriads of rights. In 1902, Mark Twain pointed something out that’s still true over 100 years later, “Only one thing is impossible for God: to find any sense in any copyright law on the planet.” If we can restrict the scale of intellectual rights in line with their value, we may be able to prevent global commerce from locking up. Jeremy Bentham believed that the patent system “produces an infinite effect and costs nothing”. Nevertheless, Sterckx [the source of that quote] and many, many others believe that the argument is, a century and a half later, unproven; while a public collective faith in the benefit of property rights strengthens, based on a narrative that correlates the strengthening of these rights with progress. What we may have glimpsed this afternoon is a future global commercial battleground of the 21st century, replete with intellect, but also property and theft. Why do government agencies apply for patents? Should governments buy out some patents and put them in the global commons? How feasible is a “Controlled Options Market for Intellectual Rights”? BELLEFLAMME, Paul, “Patents and Incentives to Innovate: Some Theoretical And Empirical Evidence”, Ethical Perspectives, Volume 13, Number 2, 2006, pages 267-299, from which (page 284) MACHLUP, “Fritz, Staff Of The Subcommittee On Patents, Trademark, And Copyrights Of The Senate Committee On The Judiciary”, 85th Congress, 2nd Session, An Economic Review Of The Patent System 79 (Committee Print 1958) (Study Number 15). BENKLER, Yochai, “Coase’s Penguin, or, Linux and The Nature of the Firm”, 112 Yale Law Journal (2002-2003), http://www.yale.edu/yalelj/112/BenklerWEB.pdf. COLE, Julio H, “Controversy: Would the Absence of Copyright Laws Significantly Affect the Quality and Quantity of Literary Output?”,Journal of Markets & Morality, Volume 4, Number 1, Spring 2001, pages 112-199. DALY, Herman E and COBB, John B Jr, For The Common Good, Beacon Press, 1989, 1994. LESSIG, Lawrence, The Future of Ideas, Vintage Books, 2002. LIEBOWITZ, Stan, Re-Thinking The Networked Economy: The True Forces That Drive The Digital Marketplace, American Management Association, 2002. NOZICK, Robert, Anarchy, State and Utopia, Basic Books, 1974. ODDI, Samuel, “Beyond Obviousness: Invention Protection in the Twenty-First Century”, 1097 American Law Review, Volume 38, 1128-37 (1989). PATTYN, Bart, “Knowledge In The Past Tense: On The History Of The Moral Status of Academic Knowledge”, Ethical Perspectives, Volume 13, Number 2, 2006, pages 191-219. PENROSE, E., The Economics of the International Patent System, John Hopkins University Press, 1951. PIPES, Richard, Property and Freedom, Vintage Press, 1999. RAWLS, John, A Theory of Justice, Harvard University Press, 1971. RUNCIMAN, Brian, “Isn’t It Semantic?”, ITNOW, The British Computer Society, March 2006, pages 18-21. SHAPIRO, Carl and VARIAN, Hal R, Information Rules: A Strategic Guide To The Network Economy, Harvard Business School Press, 1999. STERCKX, Sigrid, “The Moral Justifiability of Patents”, Ethical Perspectives, Volume 13, Number 2, 2006, pages 249-265. THOMAS, John R, “The Question Concerning Patent Law and Pioneer Inventions”, Berkeley Law Journal, http://btlj.boalt.org/data/articles/10-1_spring-1995_thomas.pdf. CAMBIA and open source biotechnology, www.cambia.org. Creative Commons site - http://creativecommons.org/. in the European Union” - http://www.no-lobbyists-as-such.com/. Institute for Public Policy Research and Intellectual Property -http://ippr.typepad.com/. Jefferson’s full text and other Founders’ Thoughts - http://press-pubs.uchicago.edu/founders/documents/a1_8_8s12.html. John Kay in the Financial Times, 17 October 2006, “Innovation Demands A Far-Sighted View Of Copyright” -http://www.ft.com/cms/s/6dae4b6e-5d7c-11db-9d15-0000779e2340.html. More information on the Smiley - http://elouai.com/smiley-history.php. http://en.wikipedia.org/wiki/Richard_Stallman - and his own site - http://stallman.org/. Ovum warning that current patent rules damage innovation -http://www.computing.co.uk/computing/news/2153501/ovum-calls-patent-changes. Some thoughts from Bronwyn Hall -http://www.ftc.gov/opp/intellect/020226bronwynhhall.pdf. The Register – spoof patent on an integer -http://www.theregister.co.uk/2003/11/26/first_integer_patented/. The Royal Society of Arts’ Adelphi Charter -http://www.adelphicharter.org/. With great thanks to Wikipedia – www.wikipedia.org. Games Workshops IP page - http://uk.games-workshop.com/legal/ip/. US export views - http://usinfo.state.gov/products/pubs/intelprp/. Greenberg versus National Geographic -http://laws.lp.findlaw.com/11th/0010510opn.html. James Gleick’s “Patently Absurd” -http://www.around.com/patent2.html. My thanks for thoughts behind this lecture go to Ian Harris for much joint work on intellectual property; to Bill Joseph for immense help on the background; to George Wyner, Tony Dillof, Neil Infield and Patrick Ellum for letting me bounce some ideas off them; to Brit and Maureen Lundell for being junior and senior researcher respectively on medieval German texts; to Marc Schlossman for telling me ‘like it is’ for someone who lives off intellectual property; and a special thanks to Xenia and Maxine Mainelli for donating intellectual property to this lecture.